Belousov-Zhabotinsky (BZ) reactions exhibit spiking oscillations over time and in space. Treated as an in-vitro model system for chemical transmission of information via frequency encoding, they came into the focus of systems biology. Conducted in a Petri dish, monitoring of BZ reactions induces comprehensive video material and image sequences that need to be analysed in order to understand the reaction scheme and its parameters including side effects in detail. Aimed by the objective to relieve the biologist from this dreary task, we present a method to automate the identification and localisation of BZ oscillatory spots in a Petri dish by means of optic flow. As defined by Horn and Schunck, optic flow is the distribution of apparent movement velocities of brightness patterns in an image sequence. 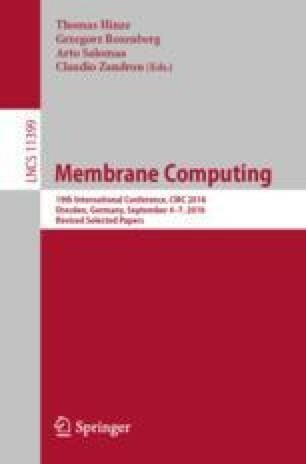 We extend the standard algorithm and adjust its parameters to make it applicable for automated analysis of BZ reactions in terms of membrane computing as molecular information processing units in space. Our approach introduces methods to cope with perturbations like different kinds of noise typically occurring by undesired alterations within brightness patterns caused by environmental influences and interference of different oscillatory spots. Current work in progress addresses estimation of propagation velocities for expanding concentric rings of each spot.